O’Grady’s Landscape installs groundcovers to help you protect your lawn and improve its appearance. Our ground cover plants are perfect for filling empty spaces in your garden or below shrubs and trees, taking the place of weeds for a healthier, more beautiful landscape. We have years of experience in planting throughout Northern Virginia and can help you select the best variety for any job, whether in the shade or sun. Let us take care of your property for you. Get an estimate on your project today—give us a call at 703-533-5001! The best types of plantings vary based mainly on their location within your property. Creeping flox, sometimes referred to as moss pink, is an evergreen that grows thick and looks similar to moss, but produces white, pink, and purple flowers in the spring. It can grow over any type of soil. Sedum is an excellent choice if you’re looking for something colorful, with small pink, yellow, or purple flowers blooming in the summer and over 300 species to choose from. It’s drought-resistant requiring little water, thick, and waxy. Since new plants form through fallen leaves or branches, sedum varieties are also easy to grow, but the location must have sufficient drainage and full exposure to sunlight. Examples include Sedum Ternatum, also known as Wild Stonecrop, Dragon’s Blood, and Blue Spruce. Ajuga, sometimes called carpet bugleweed, is best grown in direct sunlight, but can tolerate shade as well. It grows quite thick and produces tight clusters of rosettes with green foliage. Pachysandra is a popular option in shaded lawn areas, particularly at the base of trees or shrubs. Hosta thrives in areas of full or partial shade and moister soil conditions. It can grow as high as 18 inches tall, depending on which variety you choose, and typically produces leaves with dark green edges and golden centers. Multiple shapes, sizes, and shades of green are available. English Ivy is a dark-green evergreen that grows quickly and vine-like. It is resistant to freezing and drought-tolerant. 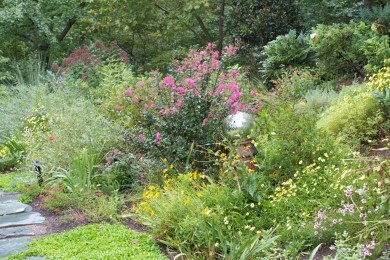 When it comes to groundcover planting in Northern Virginia, O’Grady’s Landscape is the only name you need to know. So let’s get your landscape looking its best. Fill in the gaps with just the right ground cover plants—call 703-533-5001 to request a consultation for your home in North Arlington, McLean, Vienna, Great Falls, or the City of Falls Church. We look forward to hearing from you soon!